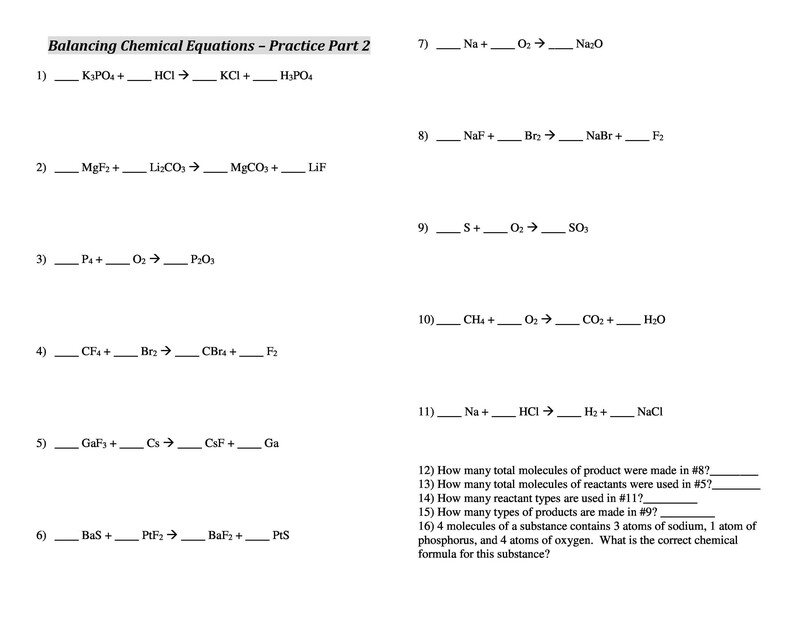 Do you find balancing the chemical equation a daunting task? If yes, then you may also get confused playing with the molecules and atoms. 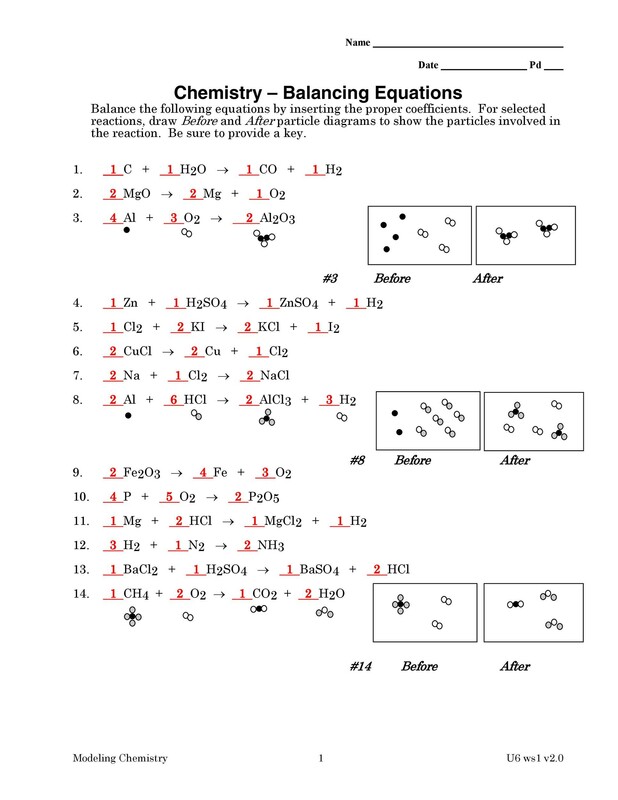 You have to balance the chemical equation no matter what, as per the Law of Conservation of Matter, but many students find it difficult to balance it. Balancing requires a lot of practice, knowledge of reactions, formulae, valances, symbols, and techniques. Often, students lose hope and struggle to solve it. 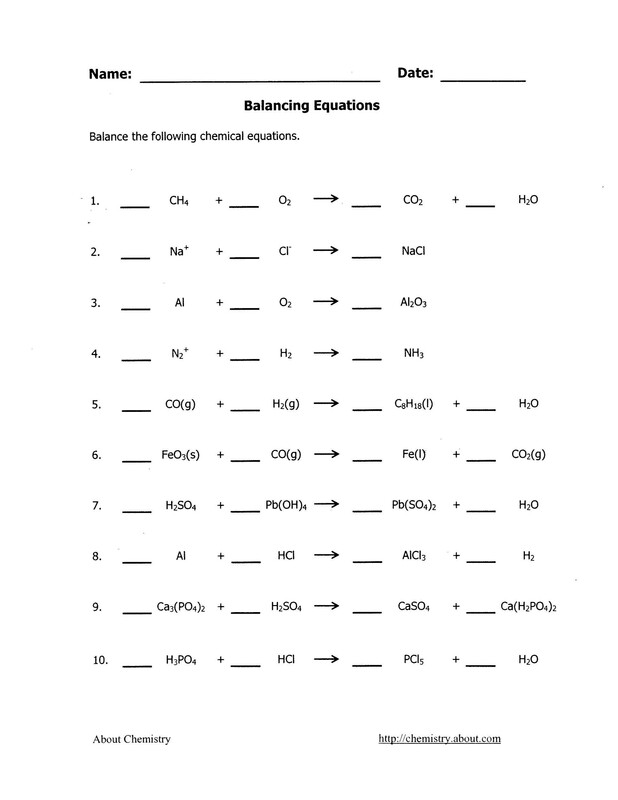 If you are struggling as well, then all you need balancing equations worksheet with answers. 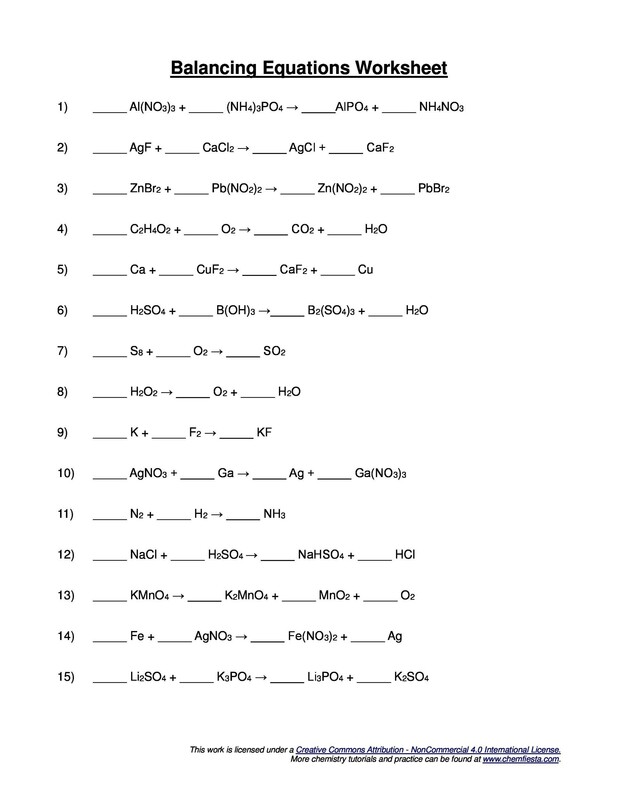 1 What is a Chemical Equation? 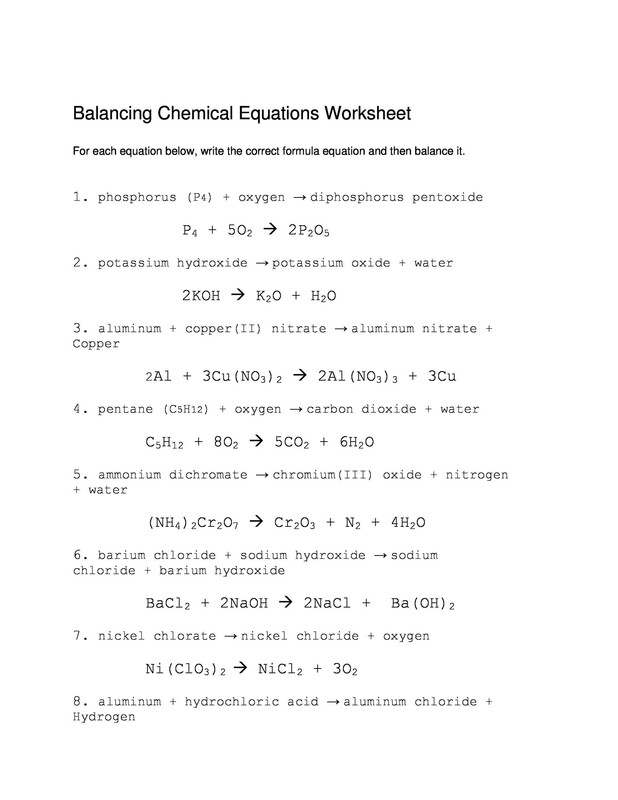 3 Why is it Important to Balance the Chemical Equations? 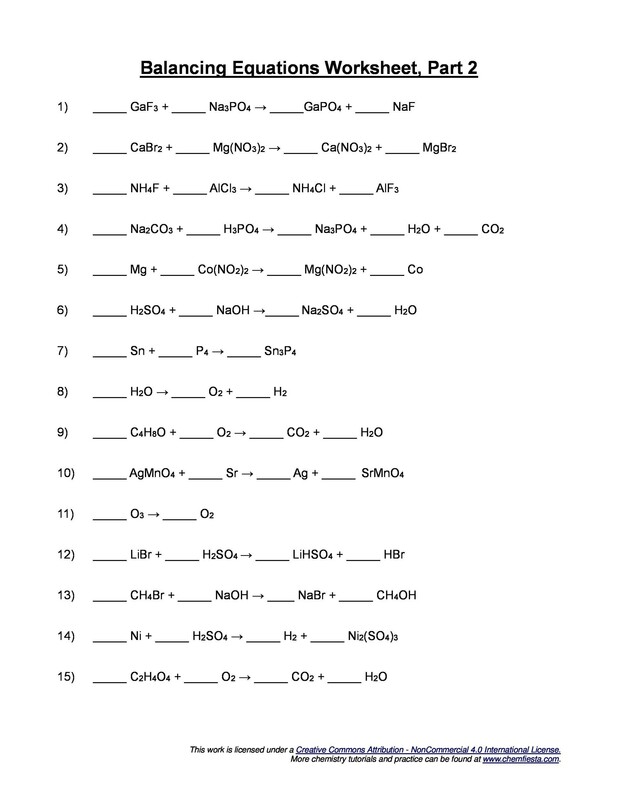 5 What are Different Types of Chemical Equations? 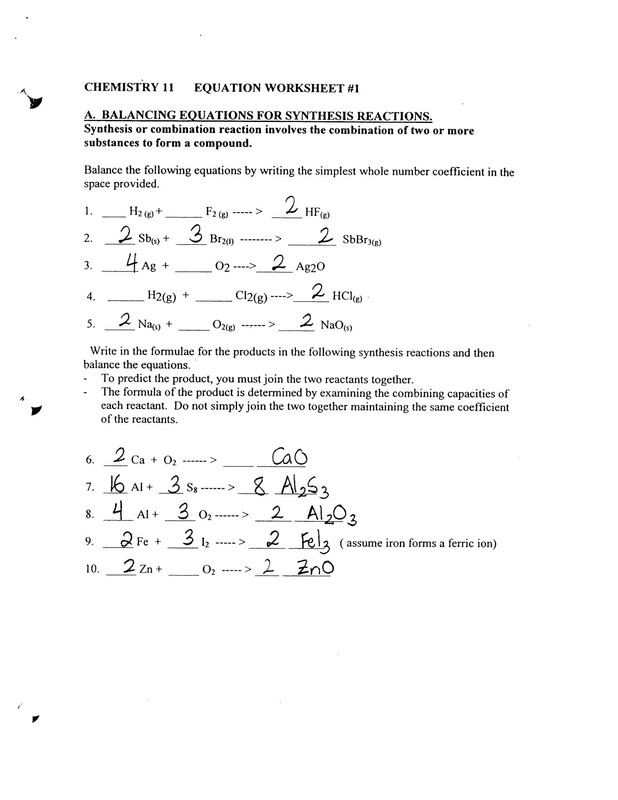 7 How to Balance a Chemical Equation? 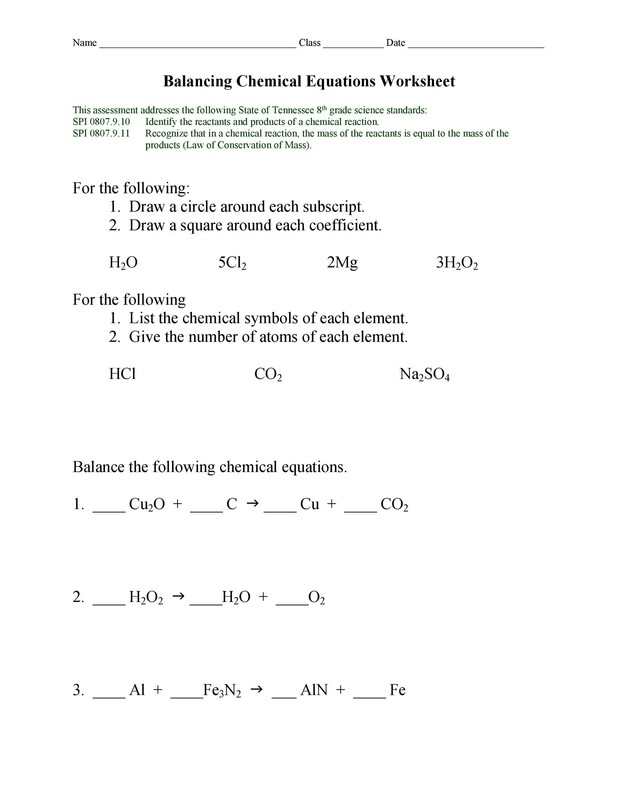 Understanding the methods and tips can make it easier for you to balance the chemical equation. When you balance the equation, it automatically establishes a mathematical relationship between products and reactants. 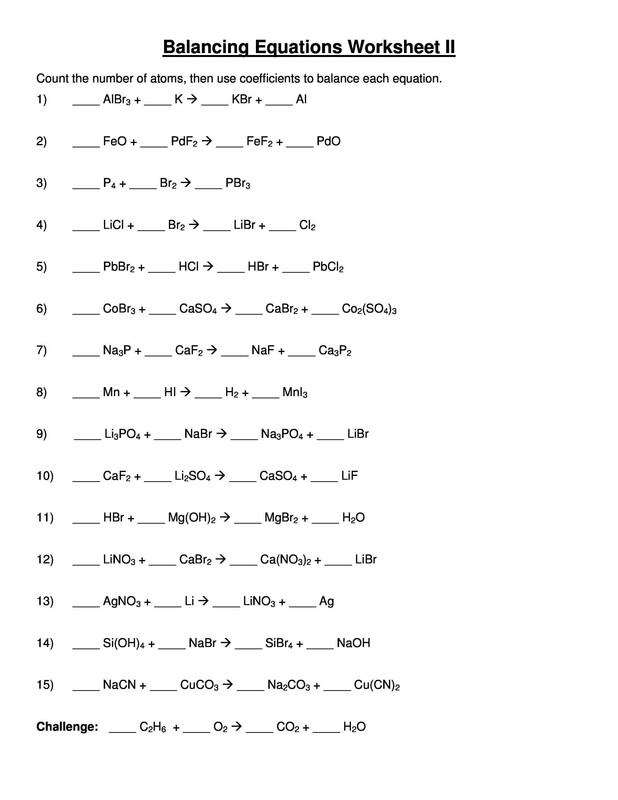 If you often get confused in balancing the chemical equations, explore some ins and outs and tips for balancing the chemical equation in the article. 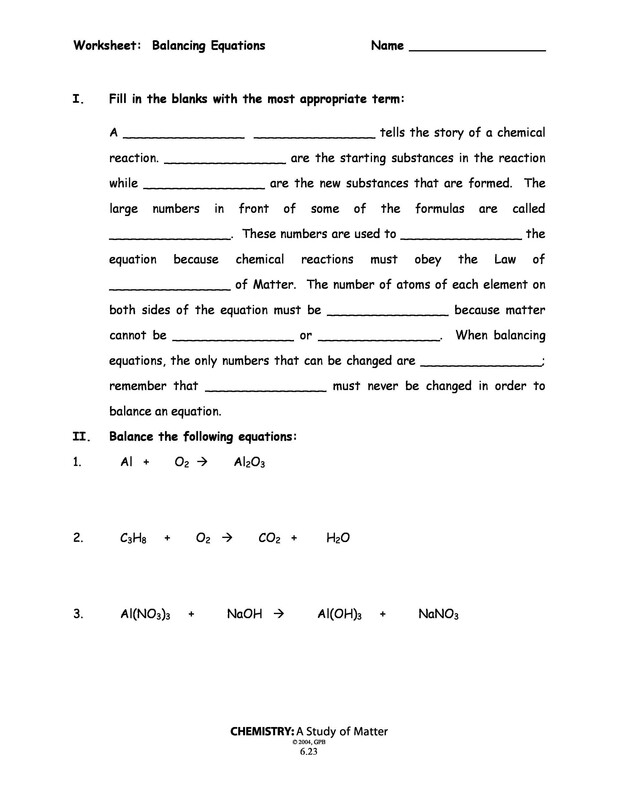 A chemical equation is the symbol in Chemistry that represents chemical reaction with the help of chemical formulas. It contains the chemical substances that are involved in the reaction. 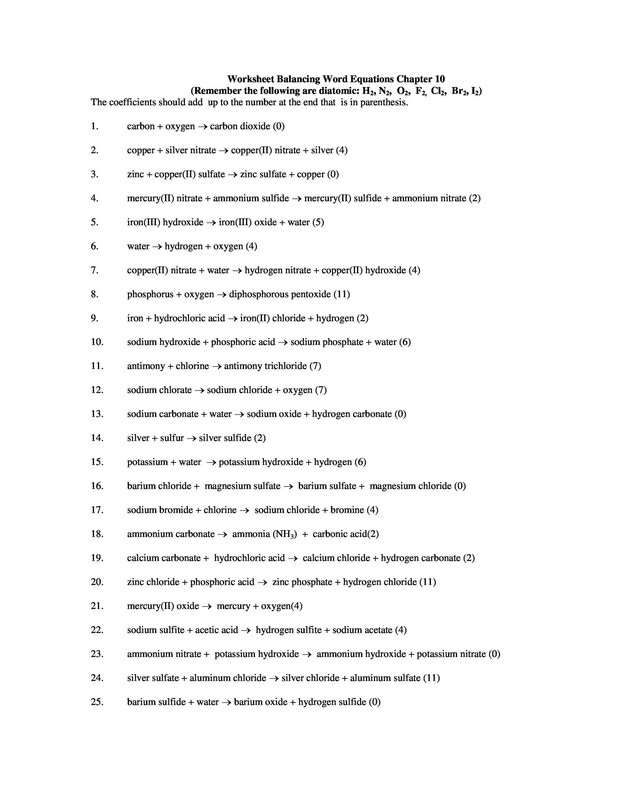 It contains reactants and products. The reactants are the elements that react with one and another in a chemical reaction, while the products are the elements that we get after the reaction. The chemical equation has the products on the right side, while the reactants are written on the left side. Both of them are separated by an arrow. For instance, 2H2 + O2 -> 2H20 denotes that there are four atoms of hydrogen and 2 atoms of oxygen on both sides of the equation. The amount of reactants must be equal to the amount of products. 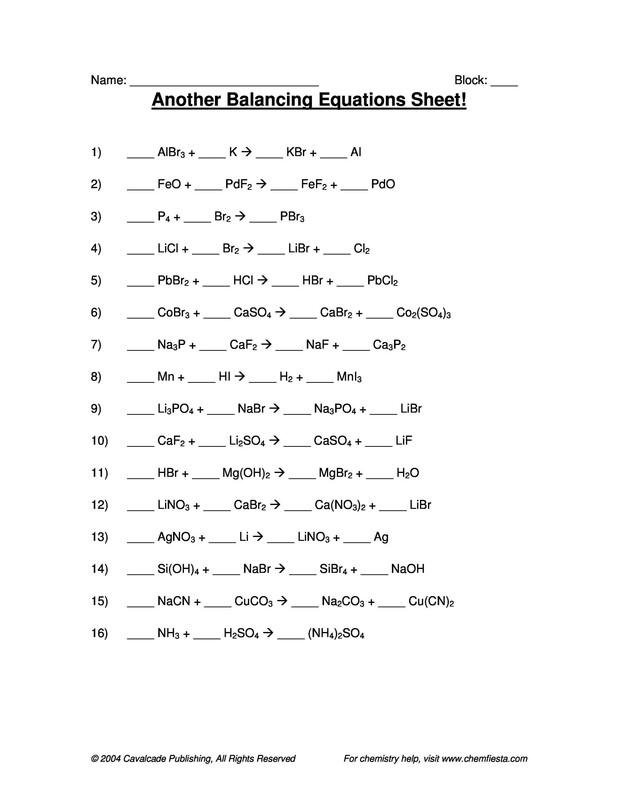 When students get big chemical equations in a balancing equation worksheet, they often find it to be very difficult. We will help you understand through some tips in this article too, to help you get through the process seamlessly. 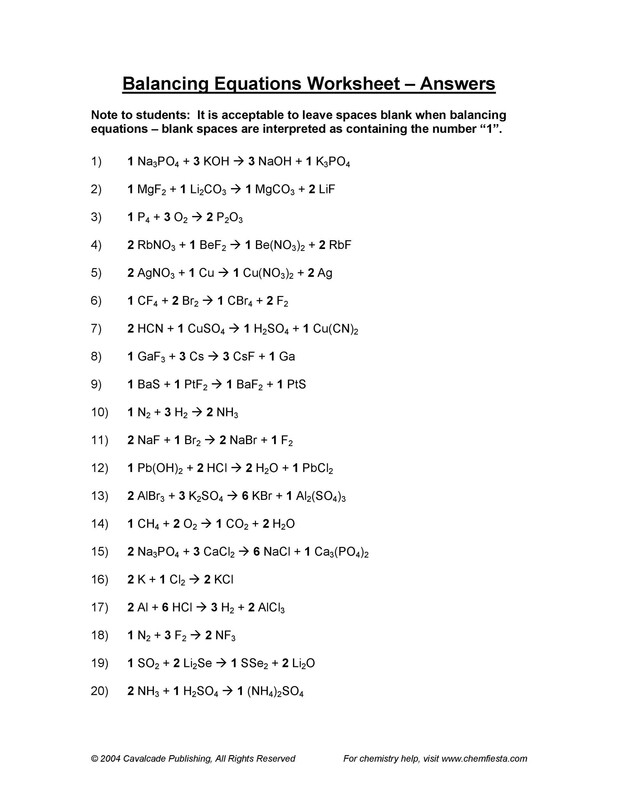 Why is it Important to Balance the Chemical Equations? 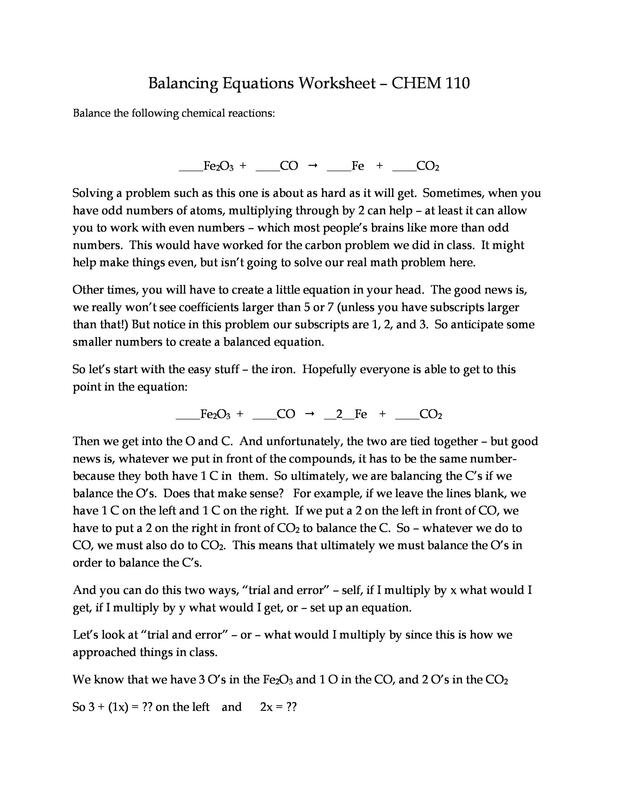 When you are stuck in balancing chemical equations, you may often wonder why you are doing so. Some students do not bother and just balance it because they are told to do so, but some of them try being logical and want to know the actual reason behind balancing it. It is necessary to balance it because there must be equal number of atoms on both the sides of the equation. Also, it needs to be balanced from both sides, due to the Law of the Conservation of Mass. The law states that there should be an equal quantity of both before and after the experiment, ensuring the quantity and quality remains the same. This law was established by Antoine Laurent in 1789. He explored that the matter either cannot be destroyed or created. Moreover, equations need to be balanced properly because unequal equations are not correct equations. No matter if they have correct elements and quantities, they will not be considered accurate. 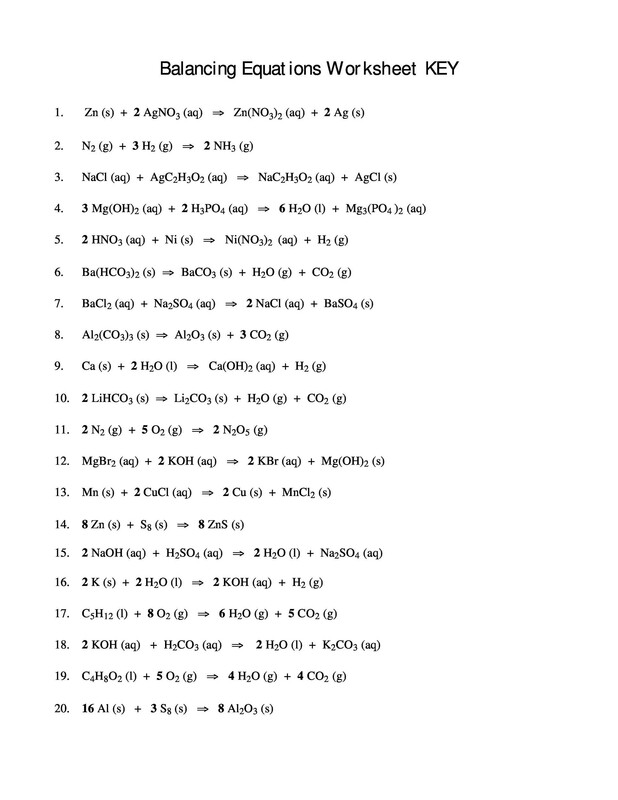 Also, these unbalanced equations cannot be used in calculating the chemical reactions. In addition to this, chemical equations need to be balanced even because chemicals will not react until you have added the correct mole rations. Additionally, balanced equation is necessary in determining how much reactant you would need to have, for making the specific product. This simply means that the correct products will not be formed unless you add the right amount of reactants. 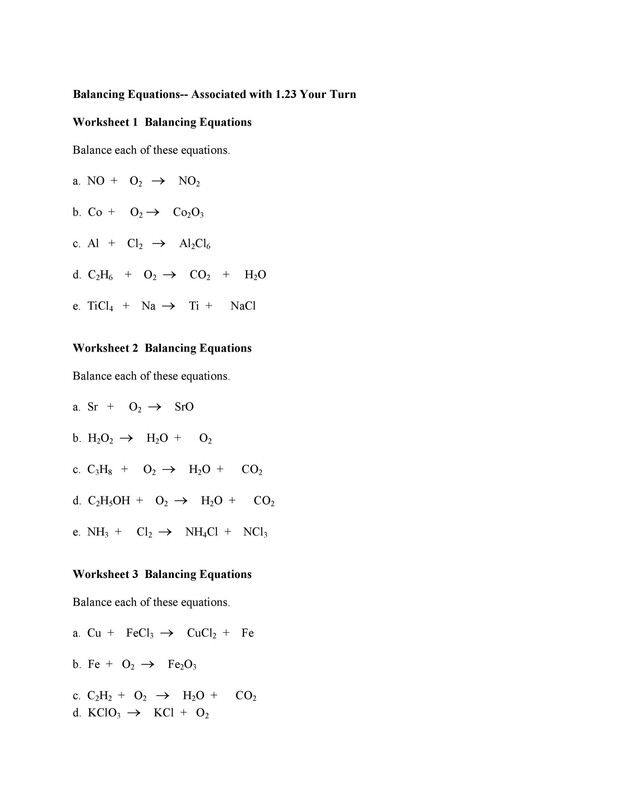 Some students really find the balancing equations difficult in balancing equations worksheet. It is hard and may require struggle but all you need to do is practice, have patience and need to have good memory. At first, you may face difficulties but you need to keep on working hard and surely you will succeed. We will be explaining the tips below in our further section, but here are brief ones. 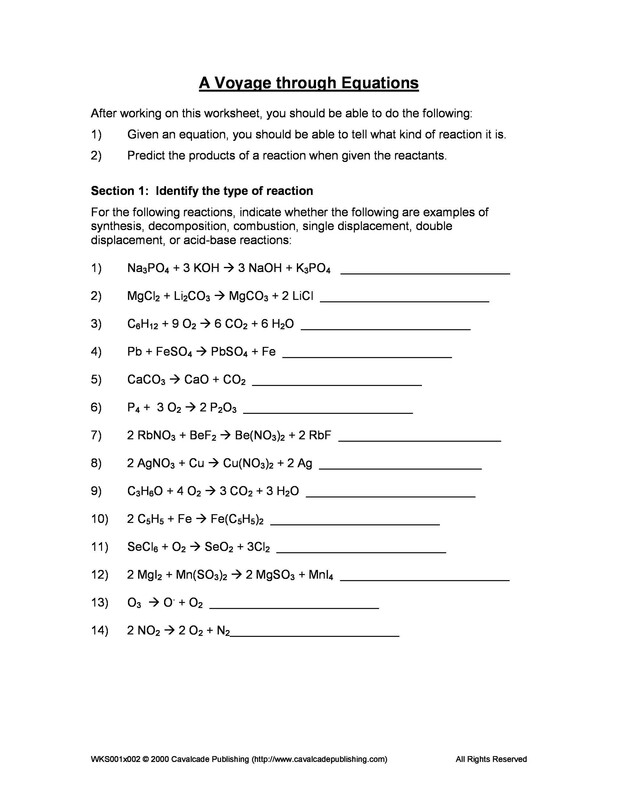 You need to learn reactions and write formulae of reactants. Understand the concept and balance the equation. Once you understand the concept, you will be surprised at how easy balancing will become for you. It may seem hard to believe right now, but keep working on these equation, and they will suddenly just click. Once you understand the logic behind them, there’s no stopping you. 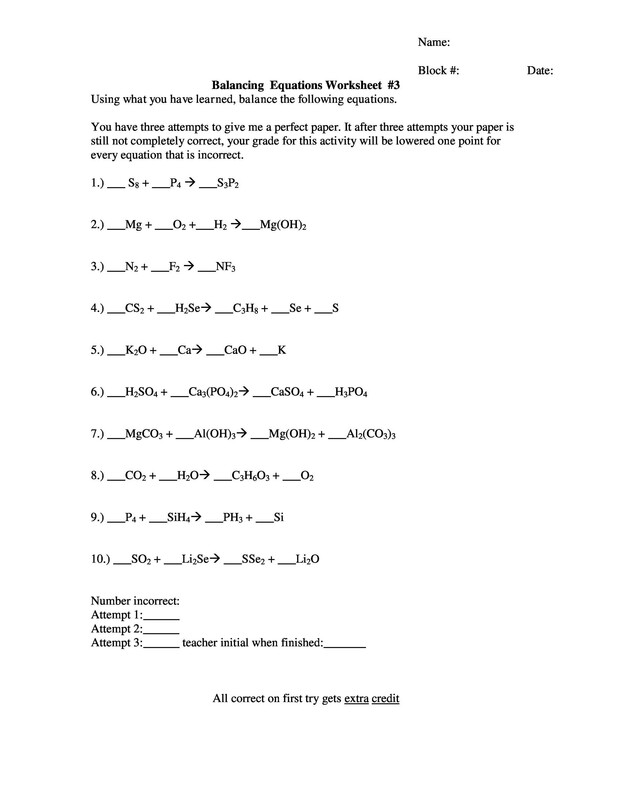 What are Different Types of Chemical Equations? 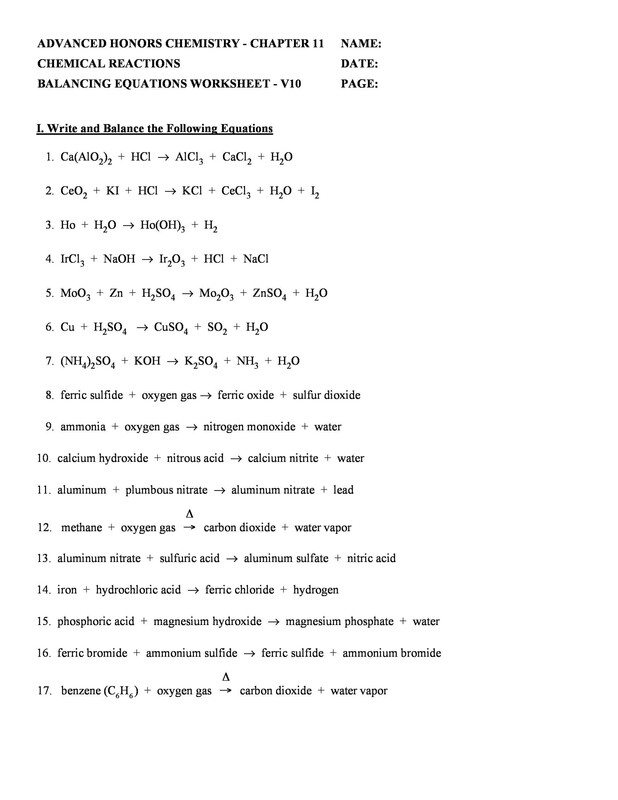 Before we help you in understanding the tips and tricks of balancing equations, you first need to know the types of chemical equations. 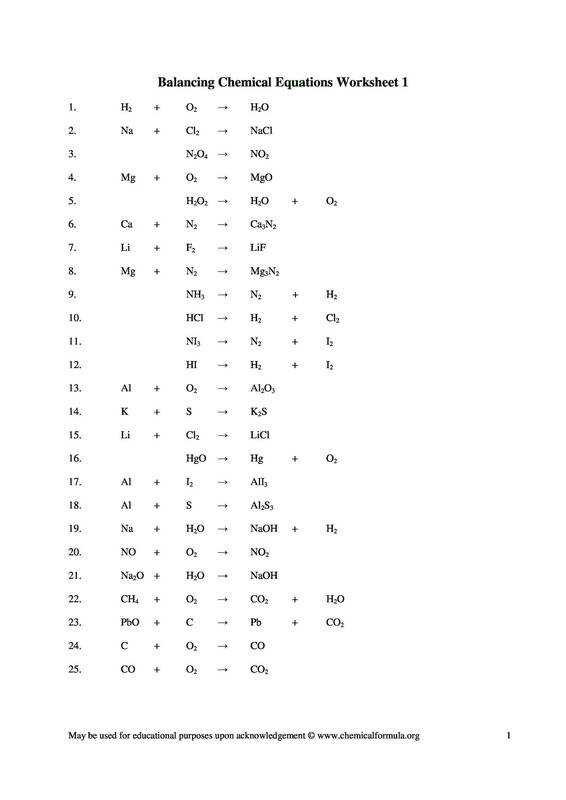 Basically, there are five types of chemical equations and their reactions. Check them out below. This is the most common type of chemical equation. In this chemical equation, a new product is formed by combining two to three combinations of reactants. For instance, H2 + O2 H2O. This is a chemical equation where two atoms of hydrogen are combined to form a product, water. This is why this reaction is called as synthesis reaction. Additionally, this is also an unequal equation because there are two atoms present for the oxygen on the reactant side while there are is only one atom on the oxygen side for product. But the equation is only valid when the number of atoms and moles are equal on both sides. 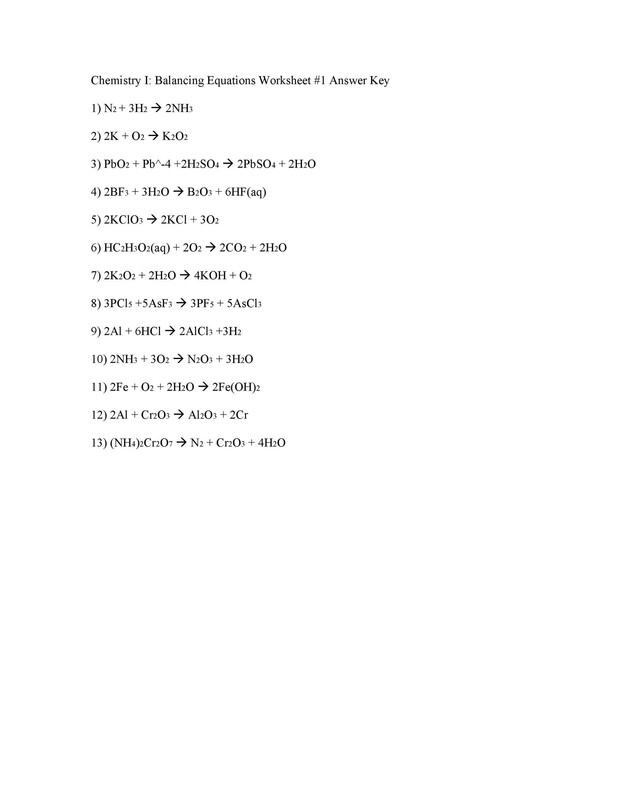 You can balance the equation using the combustion method which will be explained later. Decomposition chemical reaction is the reaction where only one compound decomposes and results in two or more than two products. 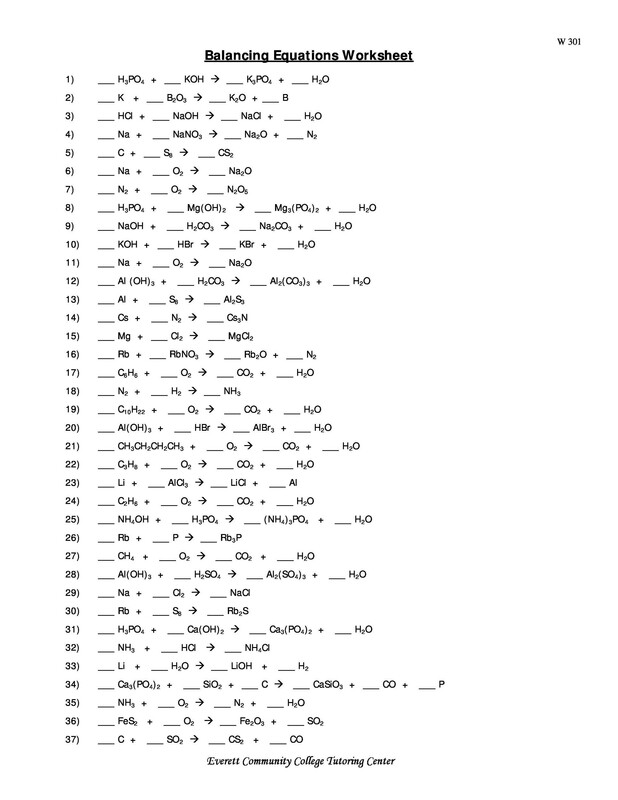 Pb(No3)2 PbO + NO2 + O2. In this equation, lead nitrate is being decomposed, which breaks down to form nitrogen dioxide, oxygen, and lead oxide. 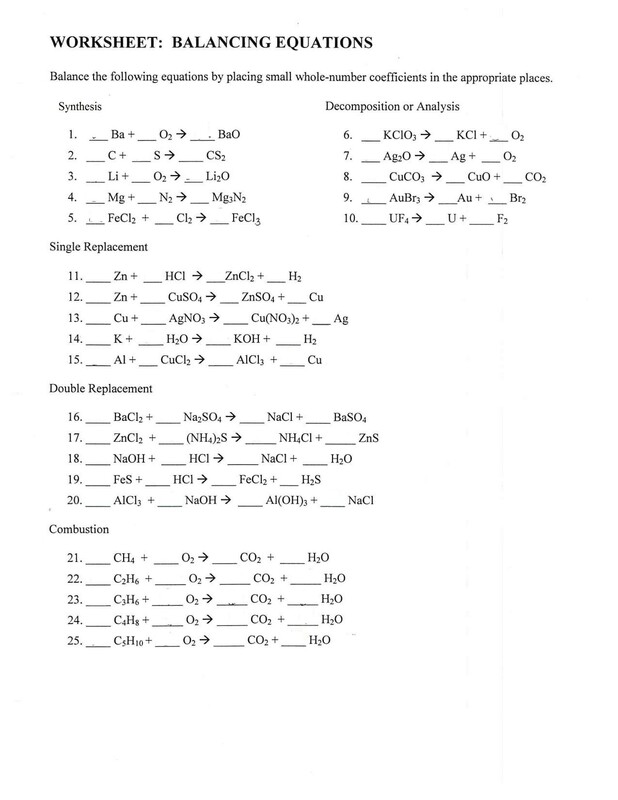 This is an example of a decomposition reaction. Another very common chemical reaction is of two types, i.e. single displacement and double displacement. 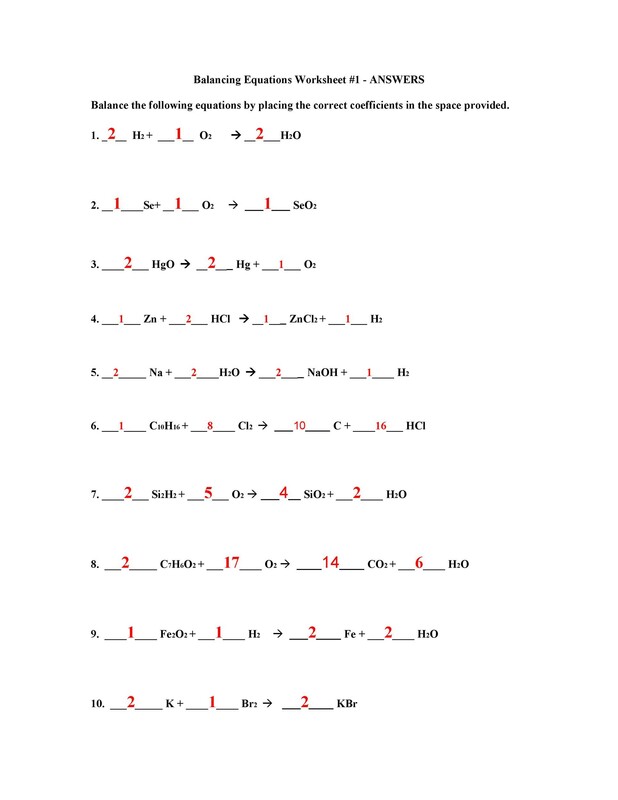 In single displacement reaction, any one chemical partner exchanges from reactants to products while two sets of chemical partners exchanges from reactants to products. 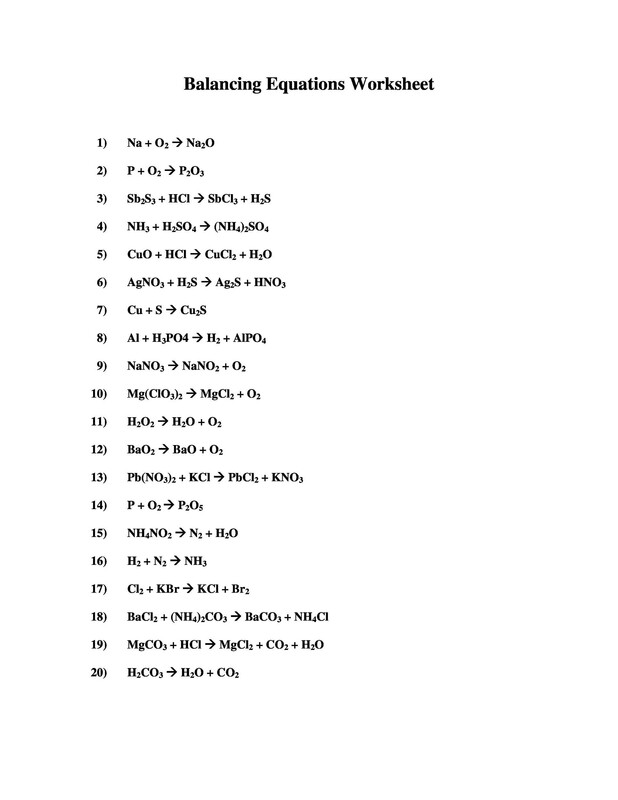 An example for single displacement reaction is XY + Z XZ + Y. In this example, zinc will replace hydrogen from sulfuric acid to form zinc sulfate. As you see, only one cation is being swapped here, that means that it is a single displacement reaction. 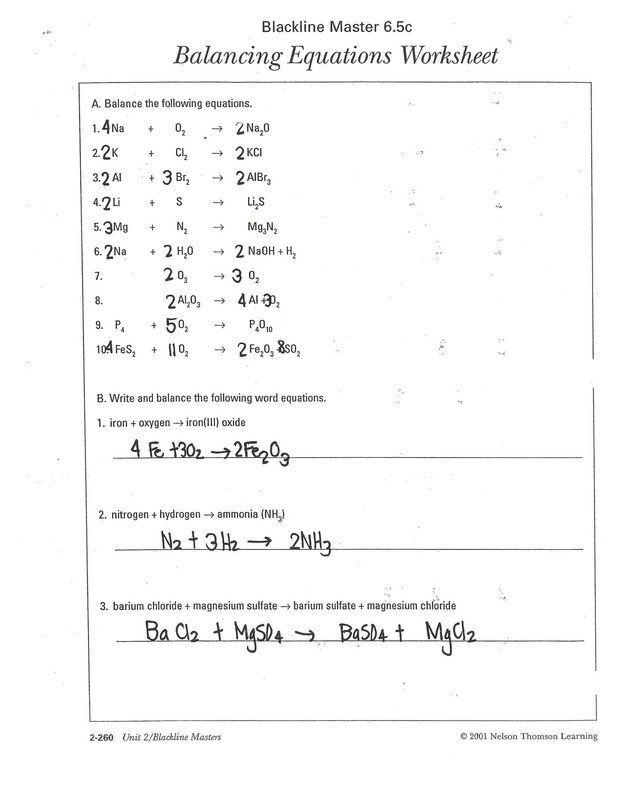 Continuing the similar example, in the second displacement chemical equation, BaCl2 + NaSO4 BaSO4 + 2NaCl would be the equation. In this equation, chloride ion leaves Barium and attaches to sodium. This is the chemical reaction where an oxygen compound and carbon compound combine together to become H2O and CO2. It is the reaction where mostly an organic compound like oxygen burns yielding to water, carbon dioxide, or some other product. The combination of any substance with oxygen results in combustion. This is the simple chemical reaction where acid and base are combined together to provide water and salt. This reaction is also called as neutralization reaction and most commonly called as acid-base reaction. These are really important type of reactions that occur in biological systems. 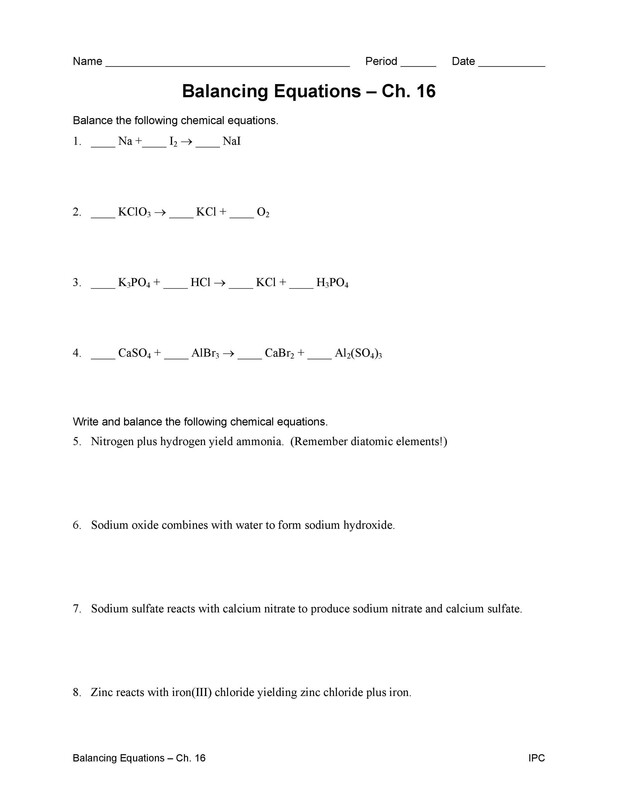 When students often get frustrated, they opt for balancing chemical equations worksheet answers to resolve the problem. 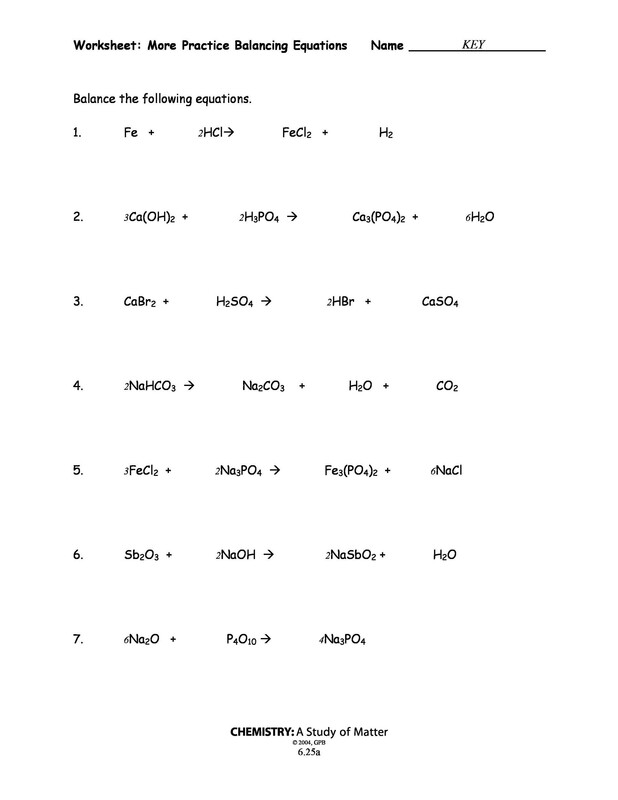 If you also find difficulty in balancing the chemical equations, follow the steps below. 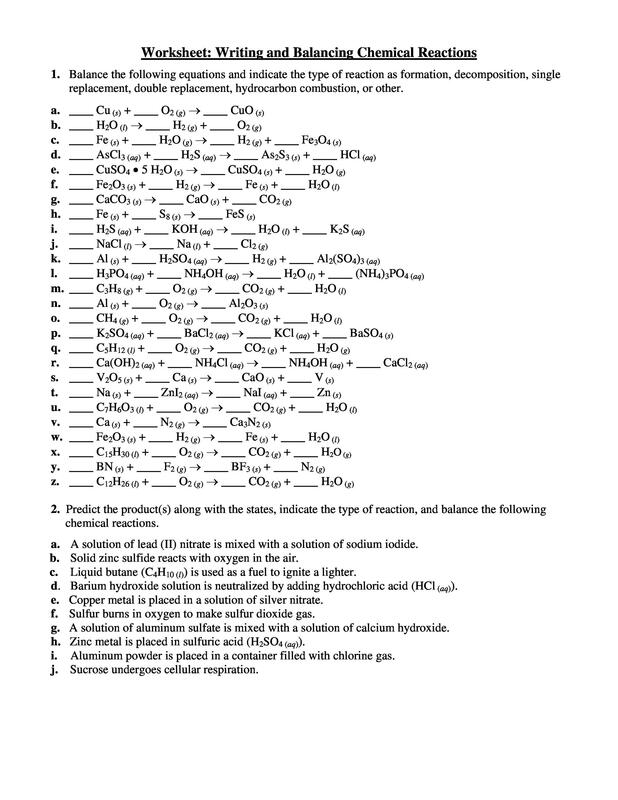 The first step to balance the equation is to write down the chemical formula of reactants that are listed on the left side of the chemical equation. 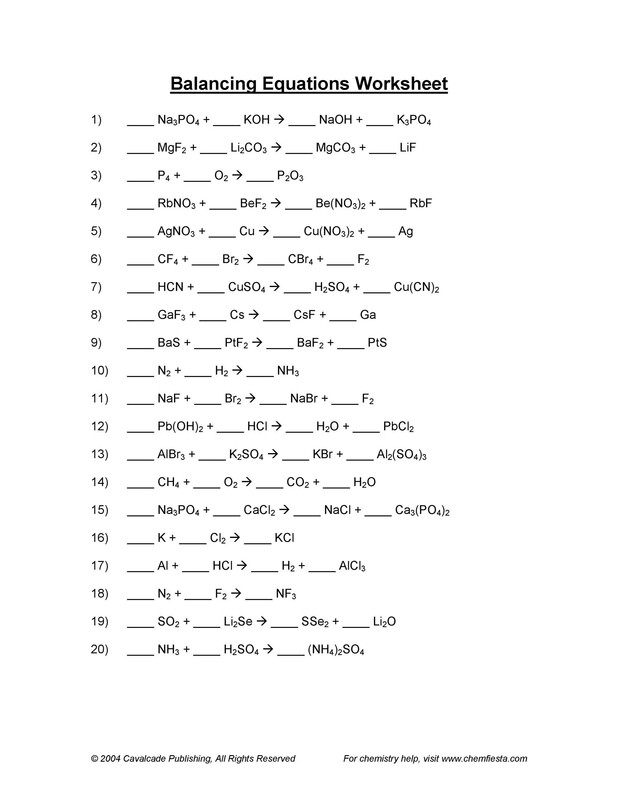 After this, you can list down the products on the right hand side of the chemical equation. There is an arrow between the sides, signaling the direction the reaction is happening in. Once you have gathered the unbalanced data, it will help you in balancing the equation. Now it is time to apply the law of conservation of mass. This law states that the same number of atoms should be present on both sides of the chemical equation. 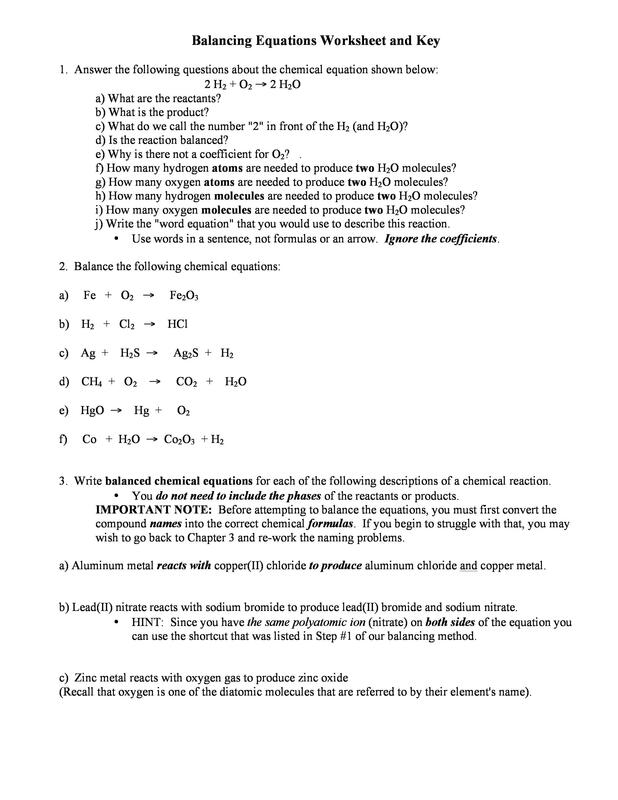 One of the easiest ways to balance the chemical equation is to look for an element that has only one reactant and product. Once that one element is balanced, you can proceed towards balancing the other one. In this way, you can keep moving to others until all the elements are balanced. By placing the co-efficient in front of them, you can balance the chemical formulas. Often people get confused and add subscripts, which entirely changes the formula. 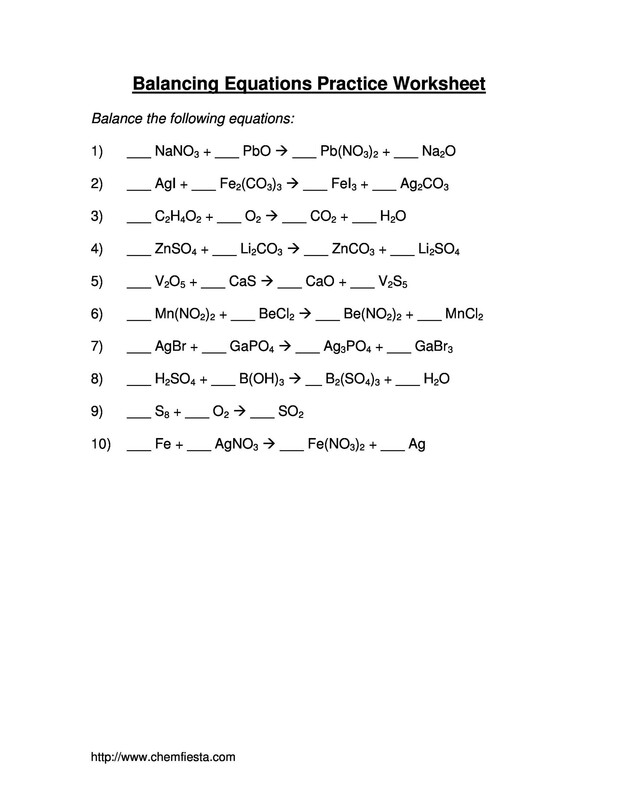 There are three basic methods to balance the chemical equation. We will be explaining each one of them below in our further section. 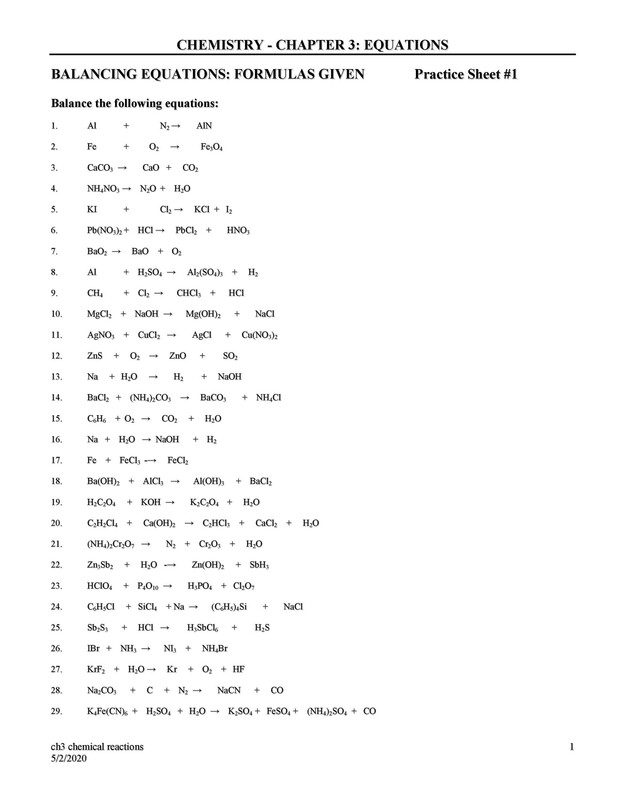 You can any one of those looking at the type of chemical equation. 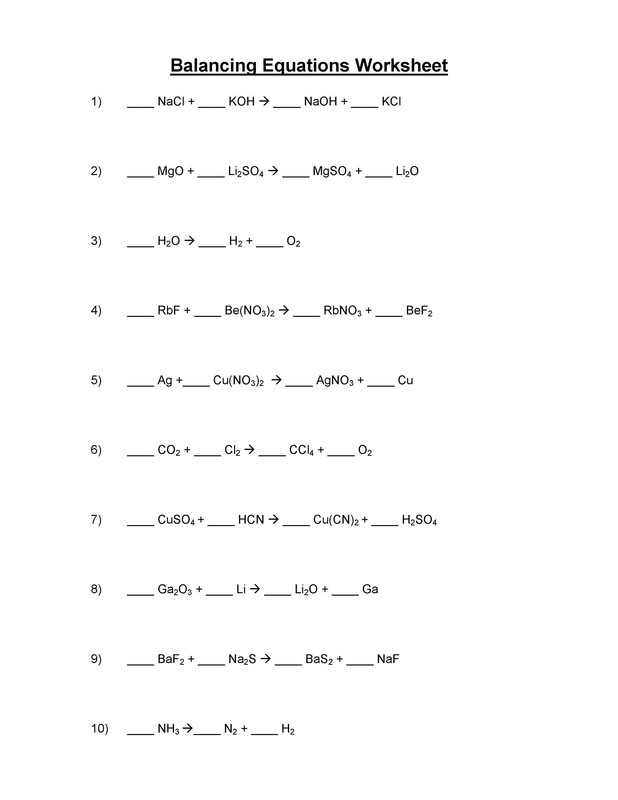 Lastly, you need to indicate the states of matter of the products and reactants. You can use g for gaseous substances. You can use l for liquids and s for solids. 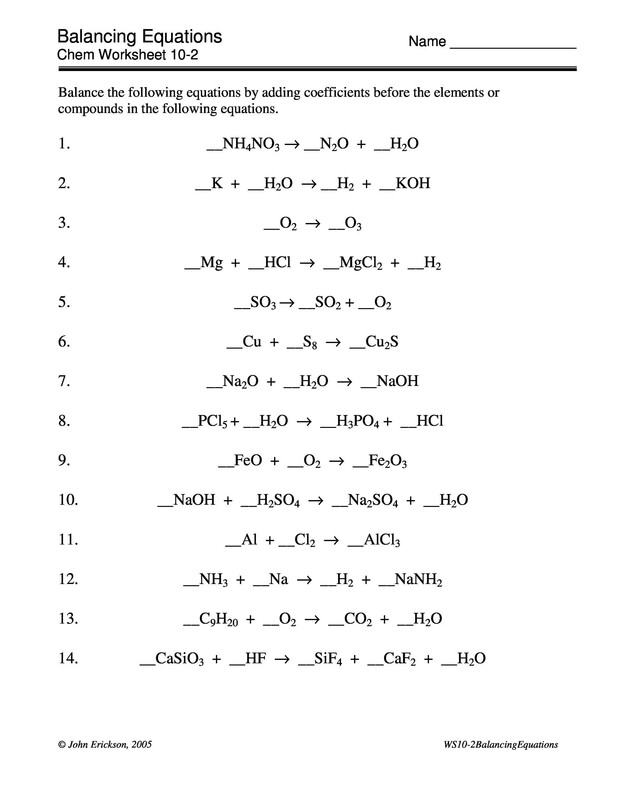 If you find species in solution of water, use aq for that. 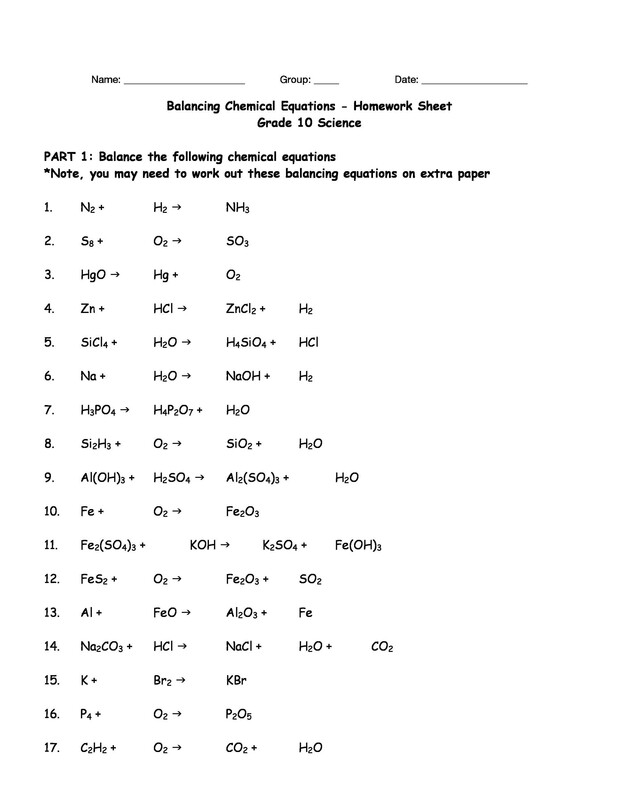 There are two different types of methods that are commonly used for balancing chemical equations. Check them out below. 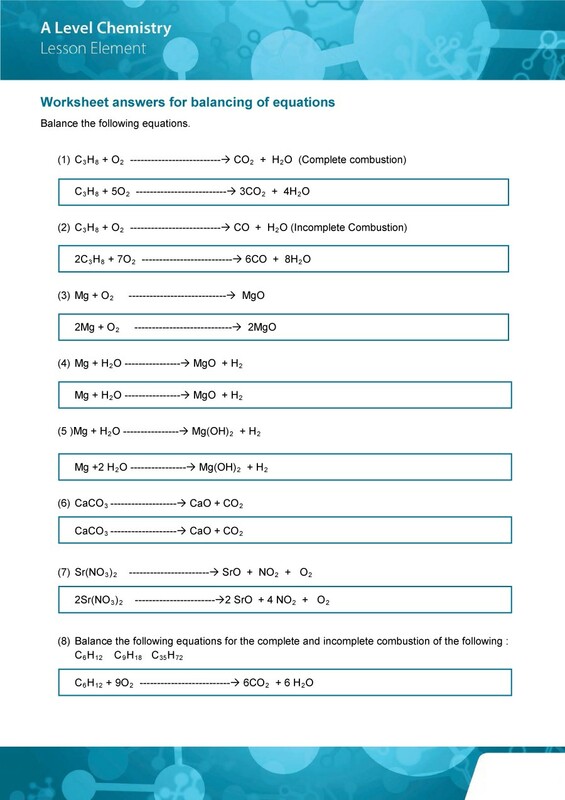 This is the type of method that is used to balanced equations that have oxygen on both sides. Often, these are difficult to balance. 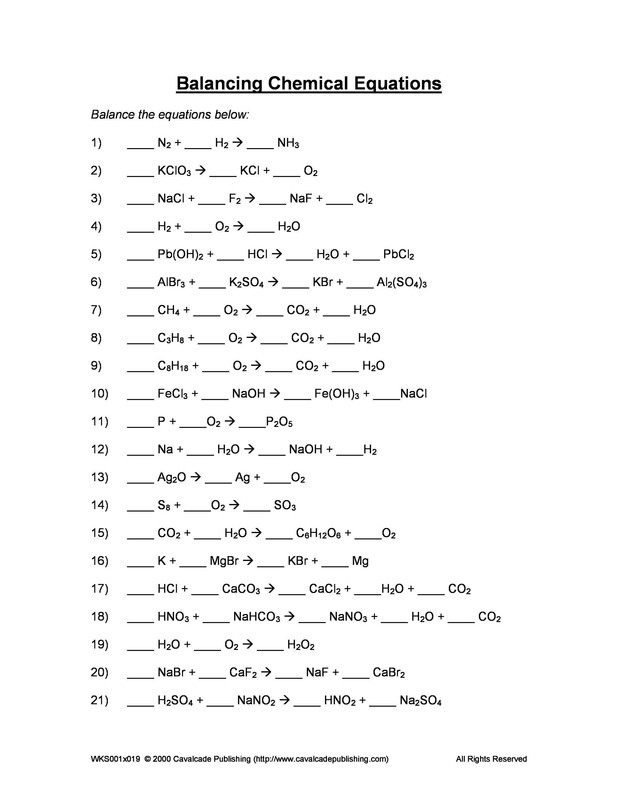 When you find difficulty in balancing the equation in the balancing chemical equations worksheet, you can miss it with a fraction of ½ and that will easily balance the equation. But the problem is that you cannot have a fraction for the co-efficient, this is why doubling all coefficients will help you balance the equation. This is the second type of method that can be used to balance the equation. It is used when the chemical equation is difficult to inspect. If you do not understand the equation after a few minutes, use the proportion method. Ensure to change the value of co-efficient and not subscript. 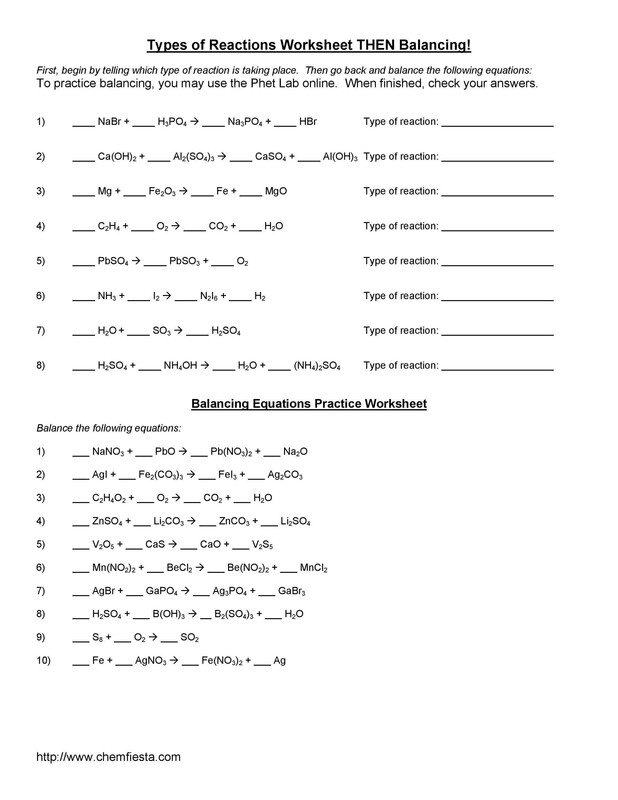 If you also get perplexed in balancing chemical equations, follow the tips for correct balancing chemical equations worksheet answers. 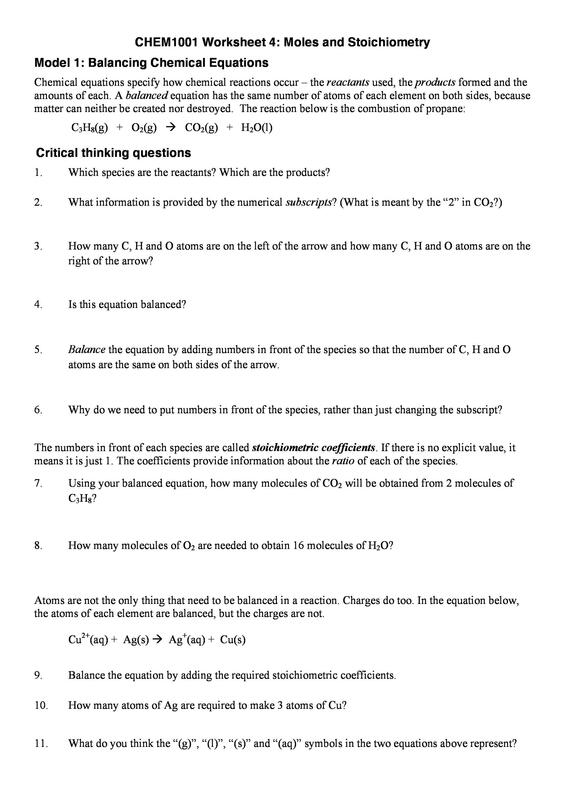 Tip # 1: When you are trying to balance the chemical equations, you should remember that you can only change the value of coefficient in front of the element or compound, and not the subscript. 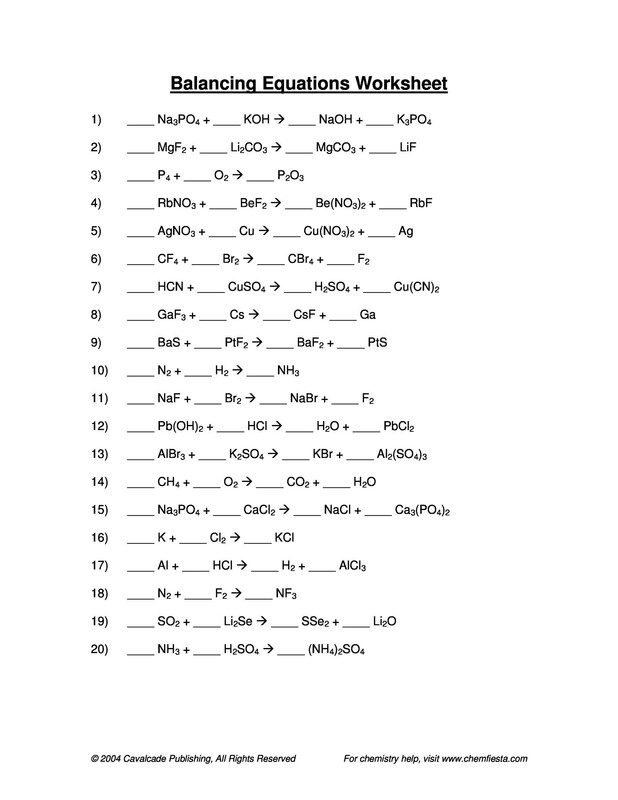 Tip # 2: You should remember that polyatomic ions should be balanced as a whole. 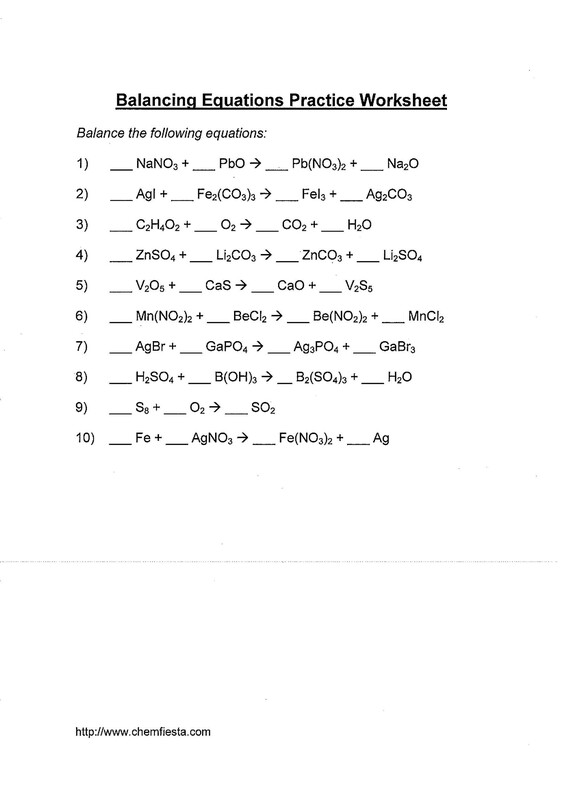 For instance, SO4 should be balanced as a whole instead of Oxygen and Sulfur separately. Tip # 3: You should remember to balance that number first that has the greatest number of atoms in any product or reactant. Ensure that these elements are other than oxygen and hydrogen. Tip # 4: You should count the number of atoms of each element on both sides and see whether or not the equation is balanced. Tip # 5: When you successfully balance the equation, ensure to check the co-efficient. It should be in their lowest term. 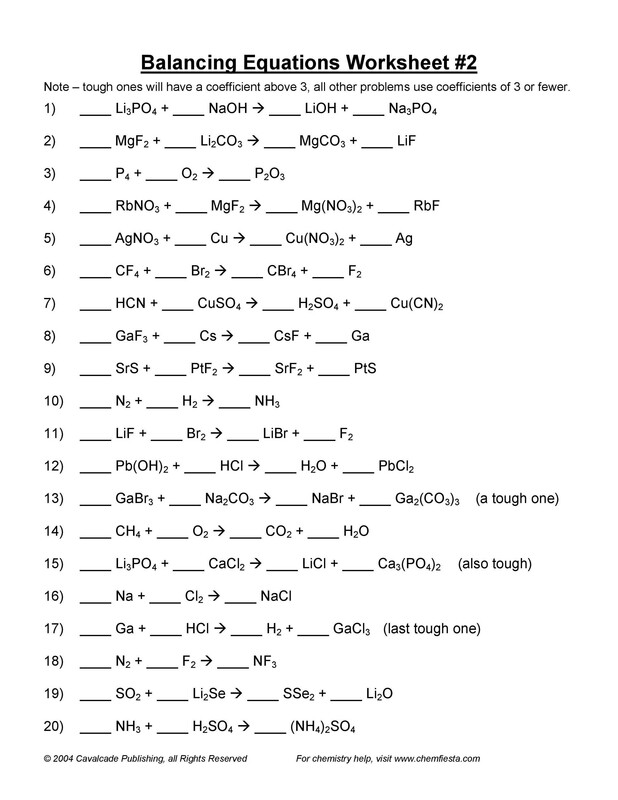 There are certain limitations for chemical equations listed as under. There are some chemical equations that do not clarify the state of substances. Therefore, you can add g for gas, l for liquid, s for solid and vap for vapor. The chemical equation does not give any information regarding the speed of reaction. Sometimes, the chemical equation also do not give the concentration of the substances, this is why terms like concentrated and diluted are used. 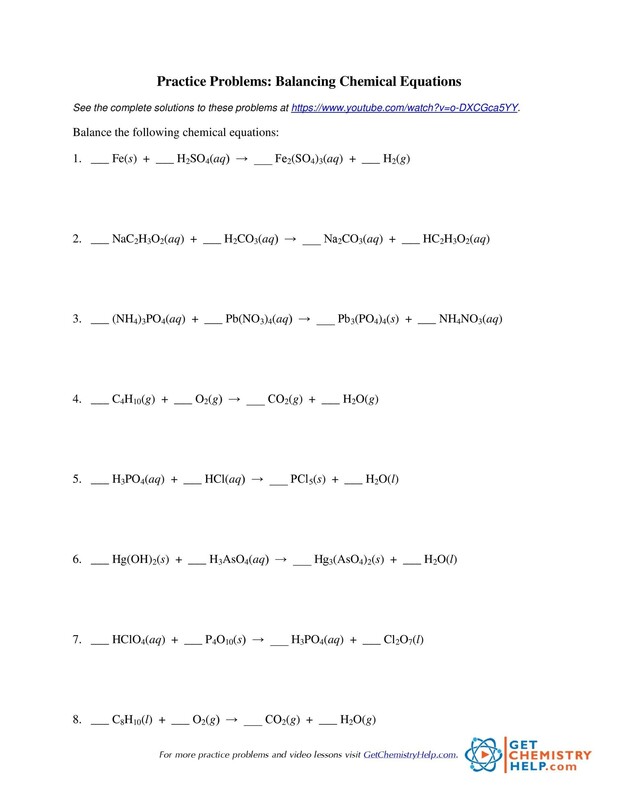 Chemical equation will not tell if the final product would have color change or discoloration. This is why it has to be mentioned separately. The chemical equation also does not give any information about the speed of the reaction. Some chemical equations and reactions have diverse affect. 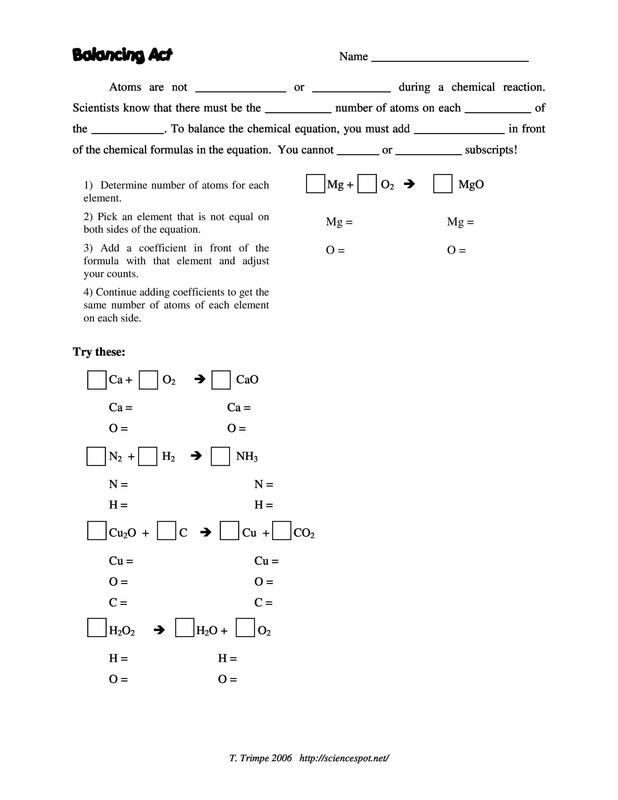 Students likely find difficulty in balancing chemical equations worksheet. 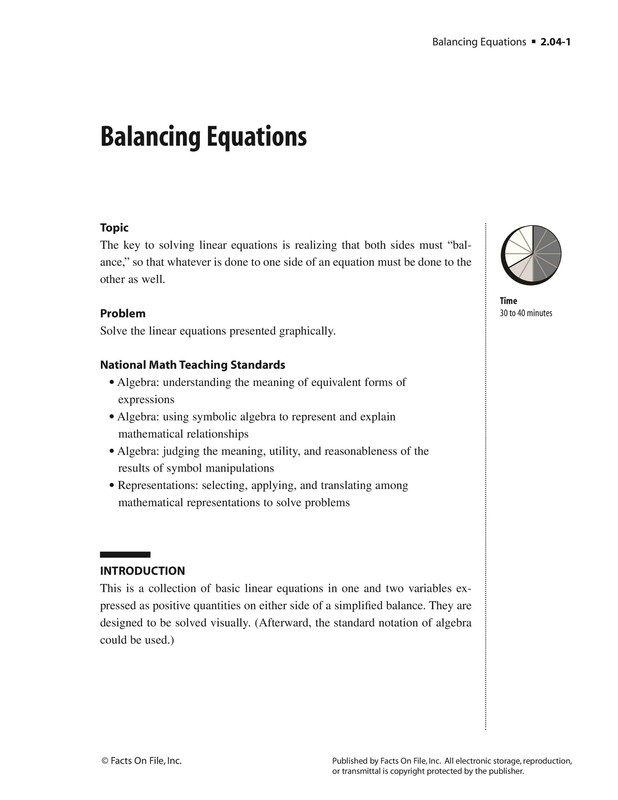 To help you resolve this issue, we have balancing equations worksheet with answers on our main website. 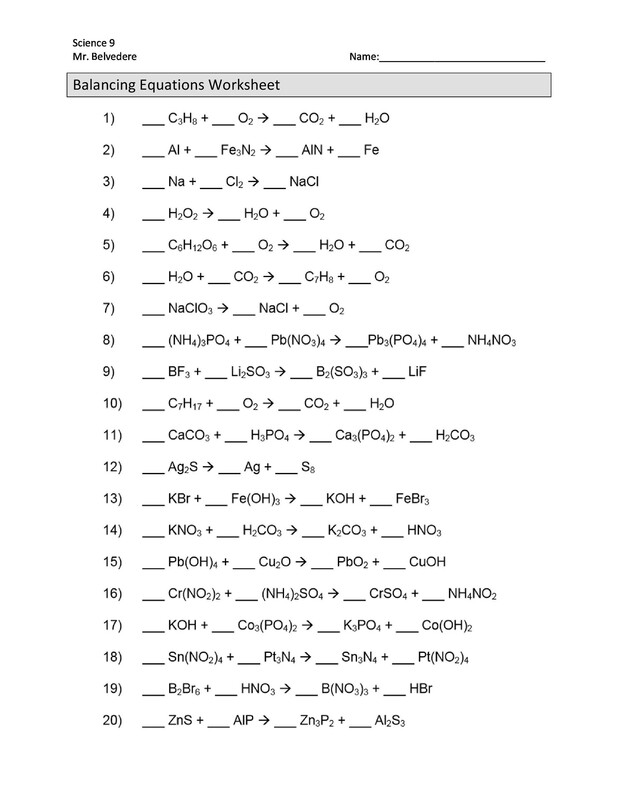 You can simply download it and cross-check your chemical equations. 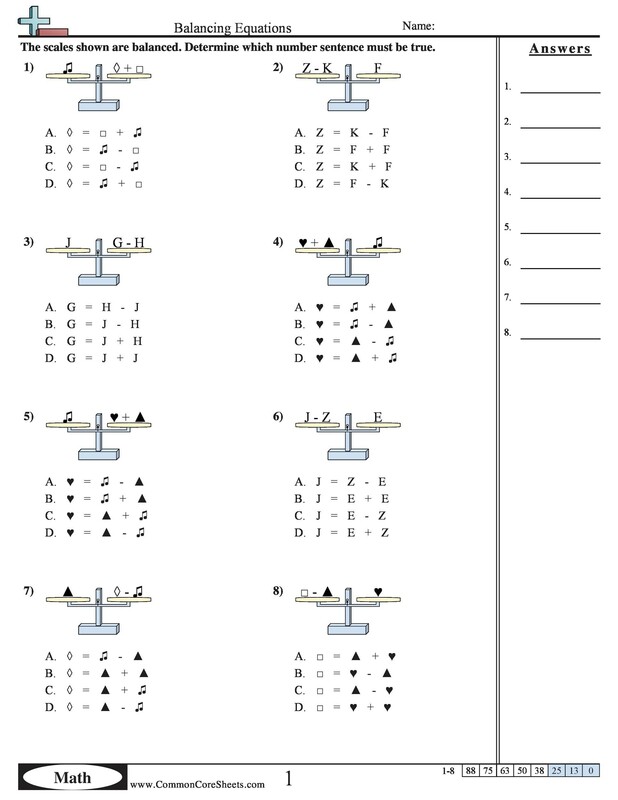 Practice for your exam using these worksheets and give your best. Good luck!